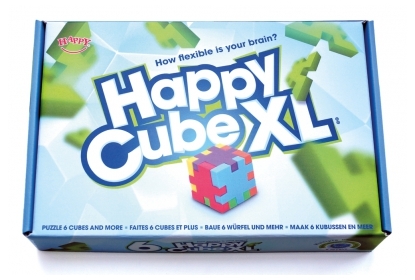 Happy Cube XL is a game set of 6 extra large Happy Cubes (5 x 5 cm cubes). The box includes 32 cards targeting 60 challenges in 4 levels with increasingly difficulty (explorer, builder, creator and architect). Get creative and astound friends and family with your impressive creations! Level explorer * - 2D puzzles and 3D cube puzzles with one colour. Level builder ** - Simple 3D construction puzzles in one direction with several colours. Level creator *** - Advanced 3D construction puzzles in two directions with several colours. Level architect **** - Advanced 3D construction puzzles in three directions with several colours. The box is made of sustainable carton and enables storage of the puzzles after playing. Play value: stimulates spatial thinking, starting from 5 year old. Play alone or with multiple players.